This new ultra high performance tyre is specifically designed to offer a shorter braking distance, no matter what road conditions you encounter. This lets you stay comfortably in control, so you can relax and enjoy every single journey Goodyear's Eagle F1 Asymmetric 3 ultra high performance tyre offers shorter braking distances on wet and dry roads, for a safer ride. Durability and precision steering Goodyear's new Reinforced Construction Technology results in a tyre that's lighter and stronger. This means you'll benefit from better fuel efficiency, improved tread wear and smoother handling around corners. Enhanced grip The Eagle F1 Asymmetric 3 tyre features the new Grip Booster compound, which is made with a sticky, adhesive resin to increase your vehicle's grip on road surfaces. This design provides the best braking and handling experience, so you can feel confident in any road conditions. Shorter braking distance Active Braking Technology makes your tyre react when you brake, automatically increasing the surface area in contact with the road to improve the grip. The benefit? A shorter braking distance on both wet and dry surfaces, for improved safety and comfort on the road. Next generation technologies deliver outstanding performances both on dry and wet roads. Thanks to increased tire contact with the road. Adhesive resin increases stickiness with the surface. Thanks to a stronger lightweight construction. The New Eagle F1 Asymmetric 3 has been tested by independent organization TÜV and verified strong performance compared to other premium brand tires in the market. * Compared to average performance of 3 latest designs from main competitors in UHP segment (Michelin Pilot Sport 3, Bridgestone Potenza S001, Continental Sport Contact 5). 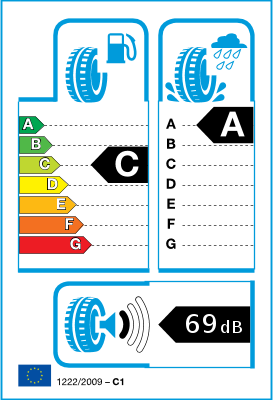 Tested by TÜV SÜD Product Service GmbH in Sept – Oct 2015 by order of Goodyear Dunlop. 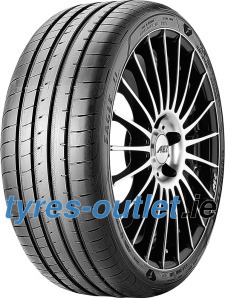 New UHP, Tire Size: 225/45 R17 91Y, Test Car: VW Golf, Test Locations: Mireval (F), Papenburg (D), TÜV SÜD PS Garching (D), Report No. 713066268. ** Scores for rolling resistance: Continental Sport Contact 5 – 101.6, Goodyear Eagle F1 Asymmetric 3 – 100, average of leading competitors – 89.1. Part of test specified above with report No. 713066268.